The May 2007 issue of EGM had a small blurb about the next Simpsons game. In the blurb they discuss some things we already knew (such as the game being based on the upcoming movie), but the writer also talks about some of the gameplay of the game. According to his source at EA, the game will employ various genres such as racing, first-person shooting, and role playing. The full scanned article can be found at the Scanned Articles page. This sounds similar to the formula used for Family Guy where each of the three playable characters' levels used different gameplay styles to mix it up, but as always everything is speculation. EA has yet to make any big announcements for their Summer and Fall game line-up, so stay tuned for solid news once it comes in. Check out a nice review for Bart's Nightmare over at Destructoid. The article is the latest in their "Games Time Forgot" series, this one written by the good Reverend Anthony. Praise the classics! Wouldn't you know it, I go on vacation for a week and come back to news (well, more like rumors) about the next Simpsons game. Apparently, all the buzz is coming from the appearance of a game called "Simpsons: The Game" on several retailer lists. These listings place the next Simpsons game on Nintendo DS, Playstation 3, Playstation 2, Xbox 360, PSP and Wii. The new tentative date is sometime in November. So, I'll have to adjust my predictions. This game will not release along with the film since that has been firmly cemented for a late July release. A November release for the game means they will be rushing to complete it before the Q4 spend monkeys hit the stores, and that's also a perfect time to release along with the movie DVD. And so, the buzz machine gathers momentum. Oh, the excitement! TMNT, the classic arcade game from 1989 starring the then insanely popular mutant turtles, is ready for download on the Xbox Live Arcade service, which is already home to other classics such as Joust and Ms. Pacman. What does this mean for The Simpsons? Well, as many should know there was another classic arcade game released by Konami in 1990 called The Simpsons Arcade. Players chose from Homer, Bart, Marge, or Lisa and battled their way across varied Springfield locales to save Maggie from the evil Mr. Burns. With another Konami arcade title now released, it opens up the possibility for The Simpsons to get on XBLA or one of the other console online services. TMNT was also released by a different publisher this time (Ubisoft), so it looks like Konami would not be one of the restraints in getting The Simpsons Arcade online. If I know my marketing tie-ins (or if FOX and EA follow Ubisoft's lead), The Simpsons Arcade would release around the time of the film in July 2007. This past Sunday's episode of The Simpsons, entitled "Yokel Chords," featured a side story in which Bart is forced to see a therapist. After dismissing the therapist's attempt to engage him, Bart is persuaded to cooperate with a copy of Death Kill City II: Death Kill Stories. Let's just hope that "Bad for Everyone" rating doesn't catch on. Another year and another update to the design. This update gave me a chance to organize the backend as well as update content across all pages of the site. You'll now find that copy throughout the site, and particularly copy at the Game Info pages, is much more coherent. A page for the next-gen Simpsons games has also been created and can be found here. Beyond that stuff, I expanded the design to include a new left column with more information. Take a look, and vote in that poll if you haven't already. It'll be coming down soon! Yours truly had the honor of being interviewed by Simpsons community guy and webmaster Malachy. You can check out the interview at Simpsons Zip. 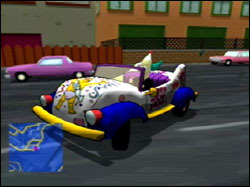 Simpsons Road Rage features a diverse roster of many Springfield citizens among the usual Simpsons family cast. Two of these citizens got some extra love with alternate vehicles and costumes that could only be unlocked during Christmas and New Year's Day, respectively. Who better to represent Christmas than an Indian Hindu dressed as Santa Claus? Christmas Apu becomes availabe when the date on your console or PC hits the 25th of December, aka baby Jesus' birthday. 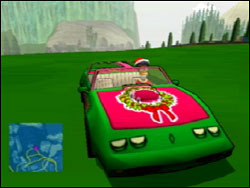 His car goes from red Firebird to a green car with "MERRY XMAS" painted across the side and a holiday wreath pasted onto the red hood. Apu dons a Santa costume and white beard. Unfortunately the car continues to be powered by 200 horses and not eight reindeer. Perhaps a more fitting match, Krusty was chosen as the character to unlock on New Year's Day. Krusty's a natural drunk, but on New Year's Day he's bound to get beyond wasted. Perfect for getting out on the road in a clown car covered in celebratory images such as Baby New Year, streamers, and champagne glasses. Krusty sports a party tux and pointy party hat, completing the New Year's Day motif and giving us all a chance to imagine we're drunken clowns. Woo hoo! 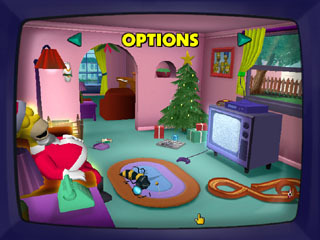 Radical Entertainment, the developers of Road Rage, simply could not get enough of the hidden holiday treats. For this title they gave us hidden alternate menus that would change the Simpsons' living room based on the date. While they left out the New Year's theme this time, they did include a little bit of Christmas. Check out Homer in his Santa suit and other nifty Christmas brick-a-brack. For those too impatient to wait until the end of 2007 to unlock the holiday wonders (or too lazy to change the system date), check out the Codes and Secrets page for codes to unlock these features immediately. Party on! The Simpsons are certainly no strangers to the spirit of Halloween. Since season 2 back in 1991, The Simpsons television show has featured an annual Treehouse of Horror episode consisting of three Halloween tales. Sometimes these are original stories, and sometimes the show writers take existing tales and retell them with a Simpsons twist. See IGN.com's feature "Top Ten Segments from the Simpsons' Treehouse of Horror" for details on the classic Treehouse of Horror tales. The video game realm has received some Halloween love as well with two particular video games. The first and more Halloween-infused game is Night of the Living Treehouse of Horror for the Gameboy Advance. In this game the Simpsons' souls have become trapped in the treehouse of horror and they must escape their nightmares to return to their bodies. 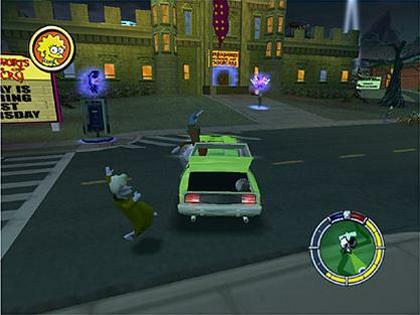 The second appearance of the Treehouse of Horror tales is in the final level of The Simpsons Hit & Run. In the climax of the game the aliens Kang and Kodos have turned Springfield into a ghoulish town filled with zombies and Halloween references galore, and it's up to Homer to stop the aliens. And hey, for the hell of it, here is a blast from my Internet past. I'm such a big fan of the Treehouse of Horror episodes that I ran two contests, one in '03 and one in '04, where online users could vote for their favorite tale or character from the Halloween episodes. Halloween Contest 2004: Best THoH Character Ever! The Family Guy Video Game, developed by High Voltage Software and published by 2K Games, released last week across North America and Europe. The game features an intertwining tale of Stewie's quest to take over the world, Brian's escape from the law, and Peter's relentless fight through Quahog to find Mr. Belvedere. Gamespot.com gave it a 6.4/10 and says "Though it gets the show's style of humor down pat, Family Guy is derailed by frustrating and uninteresting gameplay,", however 1UP.com chimed in with a decent 7/10 and "The Family Guy game is largely fan service and is mostly based on inside jokes and comedy that's clearly an acquired taste." Check out all current reviews for the game at Gamerankings.com. Over at IGN.com (aka the FOX-owned video game and entertainment website) there is now an official page for the Wii version of The Simpsons. While EA has only announced that the games will release on "next-gen consoles", this is a tidbit that came along with the flurry of recent Wii announcements. The page can be found here: Wii@IGN. So it turns out my crazy eBay spree resulted in many more games than I originally thought. Today I have the next three of twelve manuals. Check out the manuals at the Game Info page. After months of putting it off I finally completed the guide for the Genesis version of Bart vs. the Space Mutants. You can check it out at the Game Guides page. Today I uploaded the first half of a bunch of new video game manuals that I got along with the games in last month's big eBay shopping spree. You can view the new manuals at the Game Info page. I went a bit eBay crazy last month and picked up a bunch of old Simpsons video game magazines. You can check out the newest ads, articles, and covers at the Images section. I saw it coming but there was always hope... until now. EA has confirmed the product release roster for 2006 and The Simpsons are nowhere on the list. Check out what they have coming in the remainder of the year if you're interested. If you're a regular visitor you may have noticed a few tweaks to the site. If you're new, welcome to the newly redesigned CBG's Video Game Collection, version 6.5! It's not a complete overhaul or anything that extreme, just a few design issues that were bugging me. There might also be a few weird errors that I'll fix over the next few days. I recently came across a job posting at the EA Jobs website that called for a level designer to work on an upcoming Simpsons game. Some of the requirements include "getting" action-adventure games, having experience with platform gaming, and level building skills. Given that the most recently announced Simpsons game has had no details released, and the Simpsons movie has also been announced to release in Summer 2007 (a likely target season for the game as well), it's safe to say that this level designer will be creating platform levels on the next-gen Simpsons game. It is honestly a bit disappointing to see EA Redwood Shores (the developer) take such a standard direction with the game, but given the limited time to have the game done on a next-gen system I can't blame them for going towards platformer. Simpsons Hit & Run was a bit on the platformer side and it was fun, so I won't knock the next game 'til I try it. Macbee contributed some awesome scans of Brazilian magazines featuring Simpsons games. Sure, it's the same information that many of the other articles have, but it's in Portuguese! Check 'em out in the image articles section.